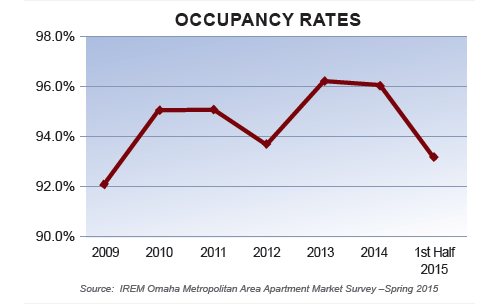 IREM’s Spring Omaha Metro Area Apartment Market Survey shows our occupancy rate dropped to 93%. Southwest Omaha fell from 99% to 95% and there was also a slight decrease in the Northwest quadrant. We will be keeping an eye on suburban softness, especially as we compare it to urban development. Many of the urban developers are having success keeping their buildings full. 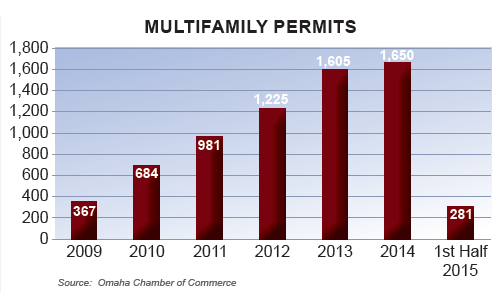 There have been only 281 permits filed for the first six months of the year according to the Omaha Chamber of Commerce. With occupancy rates hovering around 96% last year, it is surprising there were not more permits issued in the first half of 2015. As we move into the second half of the year, it will be interesting to see how we progress. While there are a handful of suburban projects under construction, the bulk of the construction activity is from fifteen urban projects totaling more than 1,300 units in the Midtown/Downtown area. If you have any vacant land over 25,000 square feet or an apartment building/complex that may be near the end of its useful life and is 12 units or larger, please do not hesitate to give me a call. We are currently in an environment where there are many developers looking to renovate or build ground up projects in well located areas. 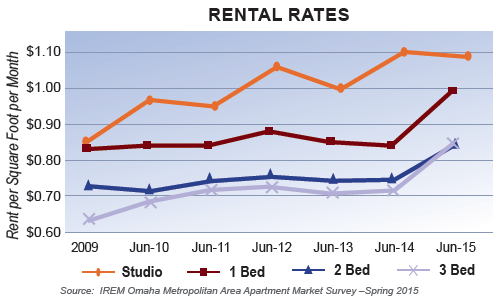 Many of the larger ownership groups and institutions are still looking at Omaha as a good place to invest. Maples on 97th Street sold to Monarch Investment and Management Group, which adds 256 units to their 20,000+ unit portfolio. Britain Towne and Fontenelle Hills, both located in Bellevue sold for $9,312,500 and $25,438,000, respectively. These two complexes were sold to out of state buyers as well.